Pumpkins can be used as more than just decoration this Halloween. As you and your children are carving jack-o-lanterns this year, put an extra pumpkin to use in festive fall recipes. Cooking with fresh pumpkin is easy, delicious and versatile. Start with a quick pumpkin puree and use it in any recipe where you would normally use canned pumpkin. A 5-pound pumpkin will give you around 4 ½ cups of mashed, cooked pumpkin (compared to about 2 cups from a can). Cut the pumpkin in half, and remove the seeds, pulp and stringy inside bits. Cut the pumpkin into small pieces and peel. Put in a large pot and cover with slightly salted water. Boil for about 25 to 30 minutes or until the pumpkin is tender. Mash and puree in a blender or food processor. Once it has cooled, use it immediately or freeze it for future use. Don’t toss those pumpkin seeds just yet! Rinse them well, coat with a tablespoon or two of melted butter and sprinkle with Italian or Cajun seasoning, salt, pepper and a little brown sugar. Spread them in a single layer on a baking sheet and roast at 300 degrees for about 45 minutes or until crunchy and browned. 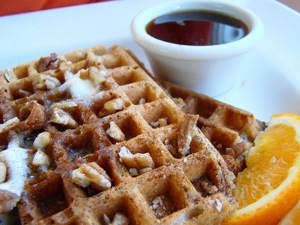 Add a cup of fresh pumpkin puree, a cup of chopped walnuts, a teaspoon of vanilla extract and a sprinkling of ground cinnamon and nutmeg to your regular pancake or waffle batter for a new spin on breakfast. Serve with syrup and a glass of milk, and you might believe it’s as good as pumpkin pie. This subtle sweet and spicy dip is perfect served with graham crackers, gingersnaps or vanilla wafers.